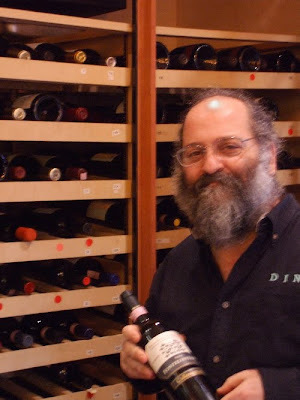 Dean Gold, owner and chef of Cleveland Park's Dino, traveled extensively in Italy as a wine and specialty foods buyer for Whole Foods in his previous job. After recovering from a heart attack ("the most momentous day" of his life) and bypass surgery, Gold headed to Italy with his wife, Kay, to soak up the good life — it was on that trip in 2002 that the idea to open a restaurant was born. The couple opened Dino in July 2005. Here are his Five Bites. 2. Ridiculously simple plates of roasted veggies from Bar Pilar. We had the Roasted Jerusalem Artichokes in winter, but anything they do like this is danged good! 4. #14 baby octopus and pork belly chul pan with fried rice from Honey Pig Gooldaegee. Fiery hot, this dish gives you two treats: pork belly and octopus stew with veggies in a thick red sauce that will clean your sinuses followed by the addition of rice, more sliced veggies and lots of nori seaweed, which is fried until there are nicely burnt bits to crunch on. Only ask for the hot sauce to be added a second time, to the rice, if you are in severe need of endorphins. 5. Soondae soup at Gamasot. Soondae is Korean blood sausage, a very rich and heavy affair. Here you get it in very spicy soup loaded with greens and other veggies (and a great spice mix scattered on top) as well as one of the banchan where it comes plain with a dish of salt for dipping.